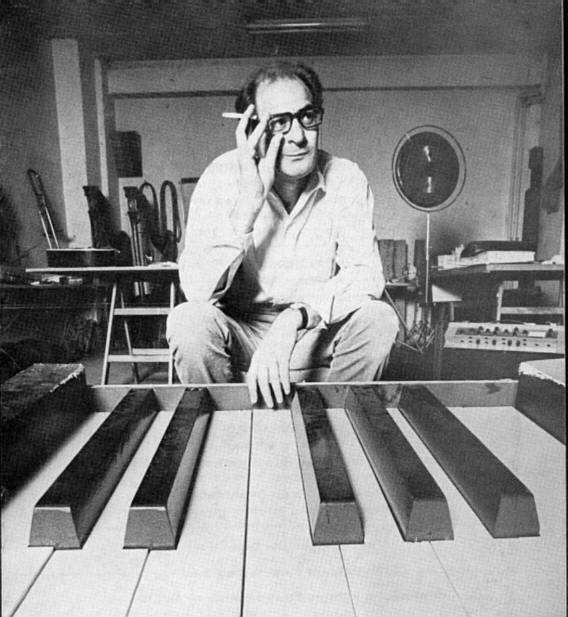 Musician as actor, composer as filmmaker, film as concert – the works of Mauricio Kagel constantly upend conventions and expectations. Often, his compositions are actually theater pieces, except played by virtuoso musicians in a concert hall rather than actors in a theater. He instructed musicians to play guitars with fan blades and coffee mills, and constructed giant instruments in which musicians were encased. In addition to creating a vast compositional output, Kagel doubled as a film director, with typically mindblowing results. Program Two is an exceedingly rare screening of Kagel’s film Two-Man Orchestra. Two musicians are inserted into Kagel’s specially built one-man-band setups (of over 250 instruments!) which they control with their fingers, feet, legs, heads and any other possible way. Trapped in these enormous, overgrown constructions and dealing with their unpredictable malfunctions, the performers evoke everything from Charlie Chaplin to circus music to complete atonality in a virtuoso physical and musical feat.